I get asked all the time about what my favorite kitchen tools and small appliances are so I thought it was time to turn that into a blog post. I must admit that I do love kitchen gadgets and small kitchen appliances. They can make cooking easier and a lot more fun. Perhaps you have discovered as have I, that my hubby likes to use gadgets in the kitchen as much as I do! You know boys and their toys! You might want to put some of these things on your own wish list or perhaps they will spark an idea for gift giving. I bought this several years ago and it’s really easy to use. 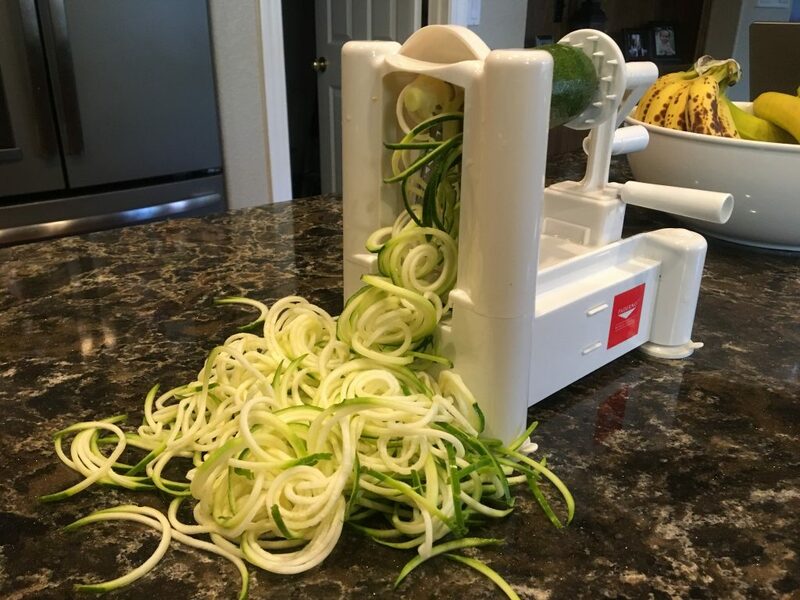 I use the Paderno Spiralizer mostly to make zucchini noodles. Then I gently warm them up in a skillet and top them off with a marinara sauce. Delightful! This blog post includes affiliate links when you use them you help support the work here without any extra cost to you. Thank you for your support. You all know how much I love my HollandBowl Mill bowl for chopping my salad everyday! You can read all about it here and learn how you can get your free mezzaluna knife and have your bowl engraved on the bottom! 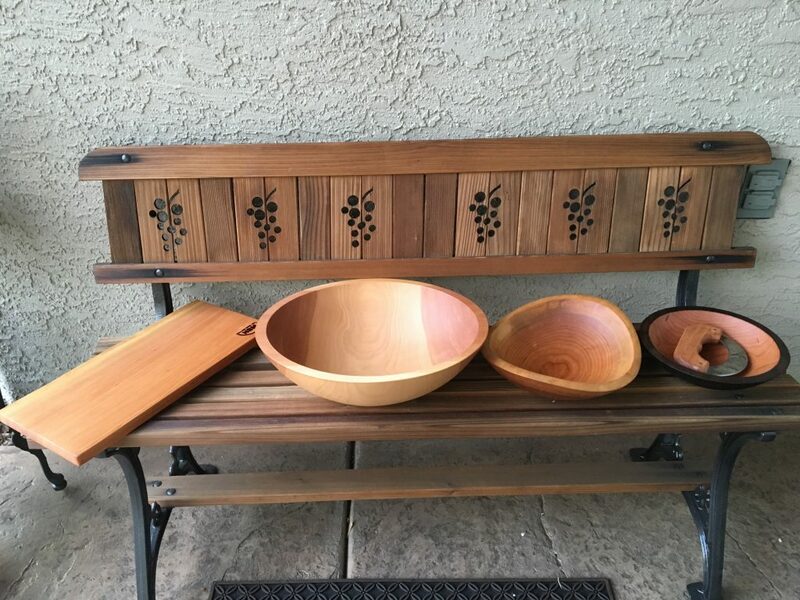 I have a thing for wood bowls and accessories for the kitchen. They are just so much more pleasant to look at than a plastic bowl. They are beautiful display bowls for fruit and vegetables on the kitchen counter or as serving dishes on a buffet or at the table. Love them! These all came from Hollandbowl Mill. We use the Snapware dishes to store our batch cooking in the fridge. The light is one I use during the winter months for seasonal affective disorder. The RoadPro oven we use when we travel by car – you can cook potatoes or heat up leftovers while driving down the road! Here is my blog post where I tell how we use the Road Pro Oven. I know that a Hollandbowl Mill wood bowl doesn’t fit into everyone’s budget. When I first started making chopped salads I had the OXO salad bowl and chopper – see the link below. It does a pretty good job – you do have to chop a one pound salad in batches as it won’t all fit in the bowl at the same time. The end result is a chopped salad and you will love being able to enjoy a chopped salad! I keep my OXO bowl at my parents home so when I visit them I can still have a chopped salad. All of these links are all things I own and enjoy using. 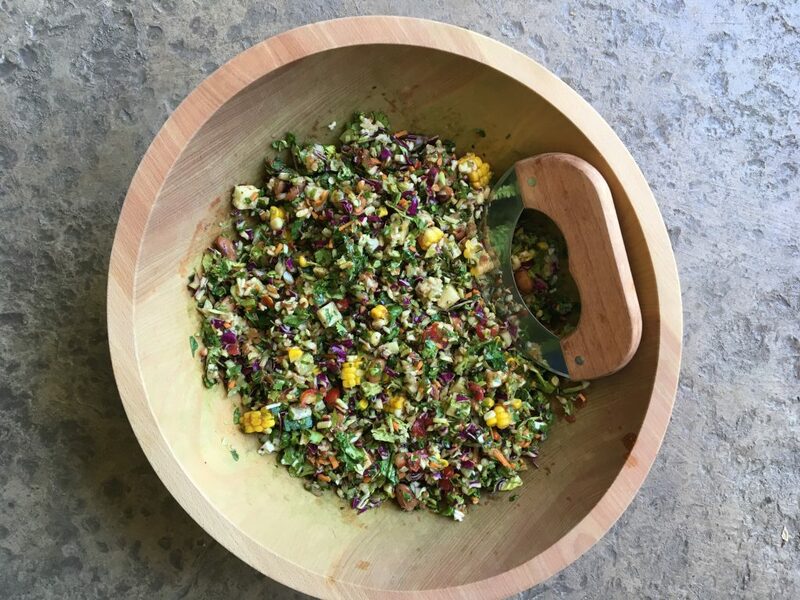 A stick blender is so handy to have, love my high powered blender and use it all the time, the dehydrator is fabulous for making healthy kale chips, cookies and granola – Chef AJ has some great recipes in her book. The Hydro Flask is my favorite water bottle. It will keep your water cold all day even in the heat! The measuring spoons are made to fit into your spice jars – clever and so handy. I have this brand of mandoline but mine is over 20 years old and looks slightly different – it’s awesome for thinly slicing veggies. The jelly roll baking sheet fits in the Breville Smart Oven Air – we use it all the time. I use date syrup in place of maple syrup in a few recipes. I love freshly grated nutmeg – the flavor is fabulous. I own and use all three sizes of the Instant Pot Pressure Cooker. At times I have all 3 of them going at the same time. We use the hot mits that were made for the Instant Pot, the steamer baskets are quite handy as well. The waffle iron is the best one I have ever owned. Although the Breville Smart Oven Air is pricey we think it has been worth every cent. We use it everyday. It is so much more than an air fryer. Click on the highlighted link above to watch my video on the Breville. I don’t use a food processor all the time but when I need one I usually need a large capacity and this one works great! Any of these books would make a nice addition to your collection or as gifts for someone wanting to cook healthy plant based meals. Chef AJ’s book, Straight Up Food and the Prevent & Reverse Heart Disease books are oil and salt free recipes. The other cookbooks have enough recipes in them that can be made oil, sugar and salt free with just simple adjustments. We can’t leave out the items we love for the grandchildren! Our little Sweetpea loves to help me cook and the Step Up Stool has been awesome. We pull it up to the kitchen island and she can stand next to me and help. Of course when she saw me wearing an apron she wanted one too so hubby Tom went on line and ordered one for her. She loves it! We keep the same dishes and silverware here that she has at home. Her mom makes her delicious smoothies that Sweetpea calls Mo-Mo (with a long o) and puts them in the cute pouches and then they go in the freezer. They are re-usable – so clever. You can get the smoothie recipe and read all about it here.The chunky little crayons are perfect for little hands and they don’t break when dropped or too much pressure is used – love that. I have an Amazon Affiliate Recommendation Page. I am always adding things to it so be sure to check it out. When you purchase items through my affiliate links you help support the work here without any additional cost to you. Thank you for your support. 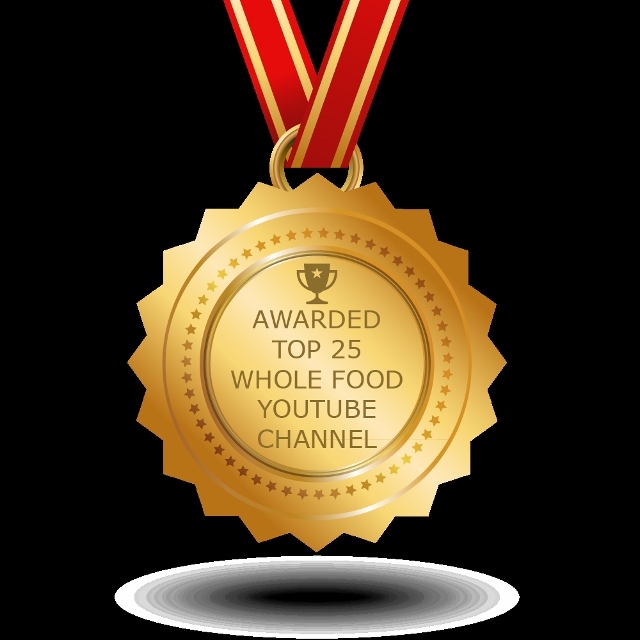 I was pleasantly surprised to find out that my Nutmeg Notebook You Tube Channel made the TOP 25 Whole Food You Tube Channel list! What an honor this is for new You Tuber! Thank you to all who subscribe to my You Tube Channel and for giving me positive thumbs up after watching! I really appreciate the support and kindness shown to me. Wishing you all a very happy, healthy holiday season! Previous Post: « Costco Vegan Haul! What a great selection! Something for everyone. Congratulations on being in the top 25!!! You so deserve that honor!! Keep those SAD recipes as a remind of how far you have come. I think about how much I used to cook out of boxes, and gasp!!! How did we eat that way for so long. Plant based is the only way to go, and I am so glad I learned more about better food. I cringe when I look in other people’s grocery carts, wondering about their lack of health because of all the SAD food in their cart. The old recipes will always be a reminder to you, of the path you have traveled. Thank you for sharing your thoughts. We are currently working on a new blog format and I have decided to not include the SAD recipes on the new blog. I just don’t want to be apart of promoting that way of eating any more. It was a tough decision to make but I am feeling good about it moving forward. Thank you for following me through all the changes I have made over the past 8 years since starting this blog. You are one of the few who have stayed with me! I am pretty sure the OXO bowl can hold up the ULU knife. It is made from the same material as some cutting boards and is made for chopping salads. The cutter that comes with it is similar to a pizza wheel cutter and the bowl is made to withstand it’s blades. I think it is a good lower cost option. It doesn’t hold a pound of salad so you do need to chop in batches but it gets the job done! Chopped salads are such a game changer – they are so much more pleasant to eat! Can you suggest another cooking matt for the air fryer basket as I see the one you recommended is not available. What step stool do you use for your grandchild? Thanks. We use this one that we bought from Amazon. We love it! This is my Amazon affiliate link.